“Shading systems have been our area of expertise for over 50 years. We happily built a reputation as a knowledge-able long-term player in the industry.” CREASHADE® supplies the latest products and services for sun control solutions. We have been converting spaces into opportunities using award-winning and sustainable solutions.We make use of the best in European engineering such as Renson® , MHZ Hachtel and Lienesch . CREASHADE® sun control solutions feature industrial quality material and award-winning attractive designs. The product range satisfies any customized sun control requirement. 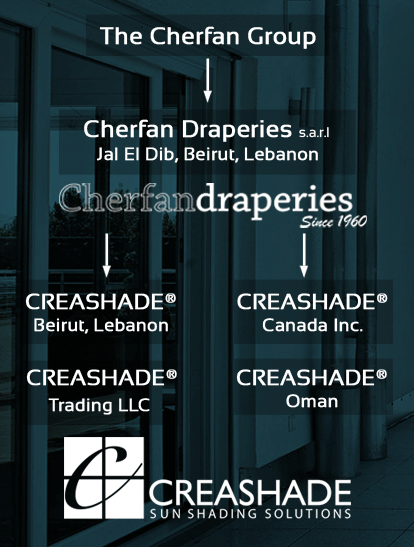 CREASHADE® is part of Cherfan Draperies, founded in 1960.From inception; we have concentrated our efforts on using systems that not only add value to the property, but also have a low environmental impact, benefiting from the exclusive advantages of RENSON® sunprotection technology. The technology is dimensionally stable for large expanses, flexible in extreme cold, and highly resistant to dirt and fading. it regulates the thermal effect of the sun, preserves privacy and comfort without obstructing the view. Engineered for strength, it delivers exceptional durability under a variety of intense wind and weather conditions. CREASHADE®’s philosophy is simple, approachable and is best summarized as “Placing Environment First”. Head for head, our collaborative team of engineers, planners, designers, & cost and project managers combine innovation with technical excellence in providing solutions that create healthy spaces, enhance and sustain the world’s built by its natural ventilated & acoustic sun protection systems. We pride ourselves on delivering personal, warm and professional attention to clients and candidates alike. The high quality of the materials used and the design of the product itself reduce maintenance to a minimum whilst guaranteeing exceptional durability. CREASHADE®, through extensive know-how and invaluable years of experience, is the most up-to date and complete production and distribution shading systems, providing indoor and outdoor products for every need. In CREASHADE® we believe that success derives from the principles on which our efforts are based, from a clear, non- negotiable goals that defines every step, every decision. • Quality management is an indispensable part of our company at all levels. • We wish to achieve customer satisfaction through attractive products and customer friendly services. • Quality must be planned, designed and produced, not just tested. At CREASHADE® we work with a team of dedicated experts. As a team, we aim at simplifying the complexity that comes with creating the perfect project, especially in the most challenging situations.CREASHADE® has been an independent family-owned company since its establishment. Today the managing directors are: Cesar Cherfan, Gerard Cherfan & Abdo Cherfan. With our own team, CREASHADE® offers a broad portfolio of services to support our clients. By designing and testing before installation we can ensure you will enjoy the highest quality of products we can provide. Based on your specifications and considering the functional as well as the aesthetic requirements at hand, we will assist you to create the optimal shading system for your design.The bottom line is we value our customers, and we take the additional steps needed in production, research and development to provide the finest product and service available. We make sure our clients understand the system, why it was selected, and how it will operate. We also make sure all your questions are answered, and inform you about issues only a professional would be aware of.Our business has been built upon the philosophy that quality people are the key to a successful business. The CREASHADE® staff represents decades of experience and every member of the team strives to build positive working relationships with our customers. We put a premium on training and keeping great employees. The depth of experience becomes your support system. Today CREASHADE® can ensure the highest level of comfort in any building by its mastery of sun protection, ventilation and acoustic solutions. What truly distinguishes us is our unparalleled customer support, the quality of our installations and our dedication to providing responsive field service. Our business is based on providing clients with unmatched selection, price and quality. CREASHADE® is able to support architects, consultants, developers and contractors from design phase to application of new projects or refurbishment of existing stock. Our high quality products add to the aesthetic beauty of a room as well as providing a high level of functionality.